We had little information about the eldest of the Beech dynasty until Heritage members Ron Historyo and Paul O’Connor discovered that we had known him all along, listed on Heritage at the time as Fighting Jack Harrison. Billy was born in Biddulph, Staffordshire, the eldest son of a coal miner, Jeremiah, and his wife Minnie. Two years later the family grew to include a second son, Isaac, who went on to wrestle as Ike Beech. 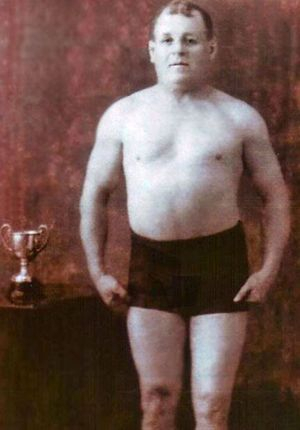 Billy was discovered catch wrestling by Ron Historyo at Atherton Football Club in 1912. The match, against Billy Nally, was reported as a closely fought contest between two good novices in the 9 stones division. Although Billy Beech was the more aggressive of the two it was who Nally took the match which lasted almost an hour and a half. By the time All-In wrestling was introduced in December, 1930 Billy was around forty years old. That’s quite an age for a change in direction and adapt to a new professional style, but Billy did it and was around for most of the decade. One newspaper report, from November 1938, says that the crowd affectionately named him “Grand-pa.” Grand-pa or not he knocked out his opponent, Jock Tyson, in the sixth round. On 12th December, 1933 we found him wrestling Bob McGregor at the Runcorn Baths Assembly Hall in a match described as the Lightweight Championship of England. Reports suggest that Billy Beech was an accomplished wrestler with a great deal of skill. Billy Beech died in 1959. Ike Beech was Christened Isaac Beech when he was born in Biddulph, Staffordshire, on 27th May, 1892. When Ike was about nine years old the family moved to Shevington, a parish in Wigan, and later Sutton Manor. He was to go on to follow his father, Jeremiah, into working life as a coal miner, at Sutton Manor Colliery, and older brother Billy into wrestling. Ron Historyo discovered Ike Beech wrestling at Pemberton Rugby Club in 1912. The match was reported as an exciting event with Ike losing because he was the lighter of the two men. During the 1920s Ike was a well known Lancashire wrestler. He also enjoyed football, bowls and rugby, playing twelve matches for St Helens between February 1919 and October 1920. According to an interview given to a St Helens newspaper Isaac started wrestling when he was thirteen and won the Lancashire Catch as Catch Can title when he was sixteen. Following the popularity of all-in wrestling Ike, who was by then around forty, turned to the professional style in the early 1930s. In 1939 an eye injury brought his career to an abrupt end. During the war he worked for the Rescue and Demolition in the ARP. Ike Beech died in December, 1958. Ted Beech was the son of wrestler Ike Beech and nephew of Billy Beech. He was born William Beech in 1921 when the family were living in Milton Street, Sutton Manor in St Helens. In 1935 and just fourteen years old Billy started wrestling on Silcock's Fairgrounds, at first near his home in St Helens and further afield after leaving school. He also followed the family tradition of working in the coal mines, getting his first job at Sutton Manor Colliery. When he started wrestling professionally Billy adopted the name Ted Beech to differentiate himself from his wrestling uncle. He was also known as Babe and Butcher Beech. He began wrestling professionally during the Second World War, and we find him in January, 1945, fighting Doulas the Turk at Blackpool Tower. Ted continued working until well into the 1960s, a career lasting twenty or more years. Our last documented match is in 1964, we find one unconfirmed match the following year whilst the Sutton Beauty and Heritage site gives a retirement date of 1968. We would like to thank family member Paul O.Connor and Sutton Beauty & Heritage website for providing information and photographs for this tribute. Paul continues to seek information on his famous relatives and can be contacted via the Wrestling Heritage website.